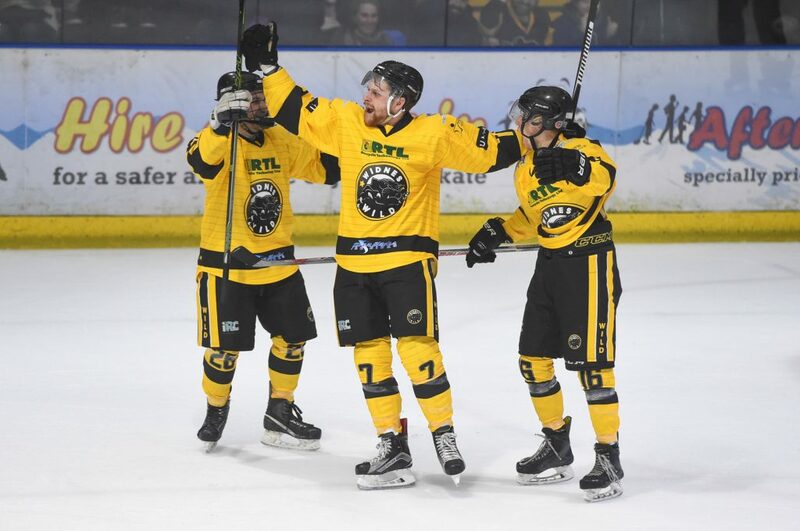 Wild player coach Ollie Barron (#7 – centre of picture) scored 8+3 in the 2-22 away win over the Dragons back in January. The RTL-sponsored Widnes Wild face a tough test this weekend with back to back games against teams at both ends of the Laidler Division league table – travelling to face leaders Telford Tigers away on Saturday before hosting local rivals, the Deeside Dragons N2 team, on Sunday at Silver Blades Widnes. On paper, the trip to Telford would appear the more difficult game, with the Tigers sitting top of the league with 40 points from 29 games. The Wild have actually beaten the Tigers twice this season already in their two home fixtures – 4-1 in September and 6-2 in October – but the Shropshire side have improved greatly since then and an impressive winning run of 12 straight games during December and January propelled them to top spot. Widnes are 4 points behind Telford with 4 games in hand and have every chance of making up ground on the Tigers with two away games still to play – this Saturday and then again on Sunday 4th March. The visit of the Dragons development side on Sunday should also be an interesting encounter. Widnes won the first meeting between the two teams 11-6 back in November but the spirited visitors had kept the score to a very narrow 5-4 until around the half-way mark, after which they noticeably tired. The away game in North Wales in early January saw the Wild notch their highest ever competitive score with a 2-22 win against a severely short-benched Deeside team so it will be interesting to see which Dragons team turns up on Sunday evening. The Dragons are second bottom of the league table with 5 points from 24 games with all of their successes to date having come against the other development team in the division – the Blackburn Hawks N2 side. Due to the close proximity (in ice hockey terms) and regular movement of players back and forth, there is always a lot of friendly rivalry between Widnes and teams from Deeside and the Dragons N2 has a lot of familiar faces in it. The team includes Gez Evans, Sam Plant, Dave Priestley, Owen Tennant and netminder Charlie Perry who were all in the Widnes-based Riverside Raiders team that won last year’s Puckstop.Com Summer Classic play offs while the second netminder – Tegan Lavery – made two appearances for the Widnes Wild women’s team last season. The Dragons team also features former Widnes import Michal Fico who originally played for the Wildcats rec team before moving up to the Wild for the 2015/16 season and then moving to Blackburn the year after. Fico is the Dragons’ top scorer this season with 14+13 from 19 games. The RTL-sponsored Widnes Wild are away to Telford Tigers on Saturday (5.30pm start) and then play the Deeside Dragons N2 team this Sunday 11th February 2018 at Silver Blades Widnes. The game faces off sat 5.30pm and doors open at 4.45. The Wild’s home game against Coventry – which had to be cancelled on 28th January due to technical issues at the Widnes rink – has been rescheduled and will take place on Sunday 18th February, 5.30pm face off.